The Gasparilla International Film Festival is Tampa Bay’s largest independent film festival and was established in 2006. It has grown since then. Today it is taking it’s place among major film festivals around the country. This year’s 2012 offering showcased over 100 films made up of features, shorts and documentaries. Filmmakers, actors and celebrities traveled to Tampa to celebrate the art of film here and around the world. Among those attending were film impresarios The Booth Brothers. They were here to screen their new film “Children of the Grave 2” at Muvico Theater in Ybor City. Their creative film contributions on the SyFy Channel are, I believe, the best work being done on that network today. Because of my ghost tour here they contacted me and we had a chance to meet. They invited me to the screening and then to the ‘after party’. At the end of the screening there was a Q&A session in which Christopher and Phillip were open, honest and gracious. They shared insights into the effort required to make a project like this happen. They answered questions about film and the paranormal. Moreover, they shared their real feelings about these subjects and I found this refreshing. I had an opportunity to chat a little more with Phillip than Christopher and found him to be a kindred spirit of sorts. My sense was that they are both loving the ride and loving the work and are dedicated to their art. The experience from first to last was a treat. I use the word ‘impresarios’ because ‘filmmakers’ isn’t quite adequate. They are gifted cinematographers who write, direct and produce. They are ghost investigators…researchers. They are story tellers. They are artists who are helping their audience see something they have never seen before. They are using their medium to make connections for their audience between the heart and the spirit. They do not use the approach so many ghost hunting reality shows use, to endlessly shift the camera in some dark, excited drama using night vision cameras as though we are on a spook house ride. Or to treat the subject like some midway sideshow. Instead, they create a sense of humanity in the process of revealing the story and the evidence obtained. I see this so clearly because they are doing, on a far more sophisticated level using an entirely different medium, something not so far afoot from what I do here on my tours. I and my guests do some investigating, recording and photographing…but most of what I do is storytelling in which I attempt to acquaint my tour participants with the ghosts themselves, with their stories and maybe with their attachments and why they remain. I attempt to connect my participants with the human condition of these individuals who have become ghosts. In doing so I hope to touch something deep. The Booth Brothers are artists using a different medium to invoke the art of storytelling in which I believe they too wish to touch something deep. And how do they do this? First, they use historical documentation in the form of old newspaper articles and photographs to inform us and to give the sense that we too are involved in discovering this history. We come to see a credible ‘past’ in each story. Secondly, recreations of events are done with a sense of accuracy and with an attention to detail but never without a stylistic flow that draws the eye in. I am a fan of cinematography and their work here, framed scene after framed scene is beautifully rendered. This illustration is done in camera with effects but not with CGI (computer generated imagery). Third, with each investigation comes finally an effort to ‘assist’ the entities toward some resolve…to give some guidance to their ‘moving on’. This part is in some ways the most chilling and the most inspiring. It is here where we as the audience make the connection that what we call ghosts are disembodied conscious beings who have some aspect of ego still intact and can be helped to move forward. They do not ‘have to’ choose to remain here. It is affective and inspiring and very different than anything else being done in reality ghost hunting shows. In fact, I believe the Booth Brothers have made a step out of the genre (which frankly is saturated) into a creative place where they have the opportunity to investigate something beyond simple ghost hunting. They are working to take us to the next level. They too, like all ghost investigators, use elaborate technology. It’s now ‘stock in trade’ for the process of any investigation. But technology is cold as is the word ‘paranormal”. 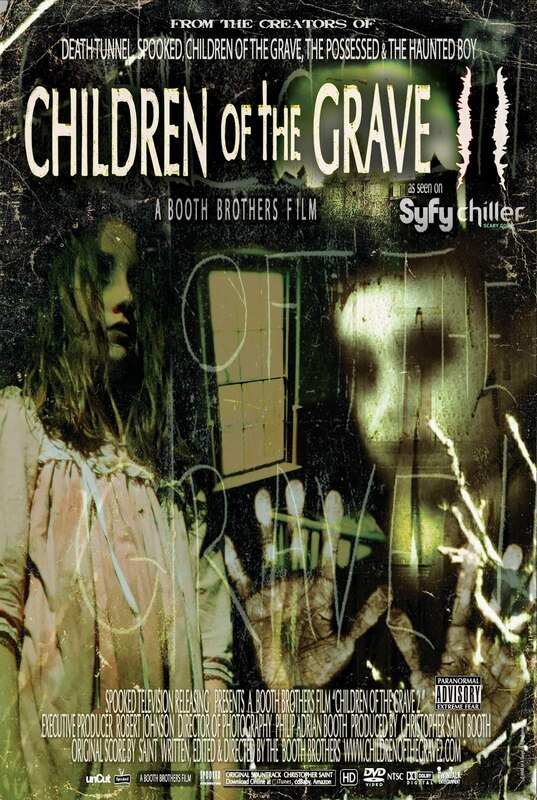 The Booth Brothers use both sparingly in ‘Children of the Grave 2’. This film does not portray ghosts being ‘hunted’. It is not the science of the paranormal being objectively applied to investigations. It is rather a rich, film exploration of something more universal than the paranormal…it touches upon the supernatural. And in doing so it touches our spirit.